Of golden dreams and flying machines … Our little inventor Ron the Raccoon has finally figured out how to fly! Just look at that smile - there has never been a happier raccoon! Your very own wriggly toes will love the soft shades of colour and fluffy clouds surrounding Ron as he cheerfully floats through the sky. A night of sweet dreams awaits in organic cotton bedding thanks to Ron’s riveting tale. 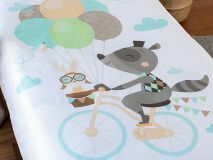 Hi, I’m Ron the Raccoon, and I just love bikes and balloons! Want to know why? You’ll have to read my story and see how my new friend Bunny and I learn to fly!